The Royal Dog Of Japan is a substantial protector endowed with devotion and dignity. A dog of such stature can only be represented by eminent Akita breeders who adhere to the Breed Standard. Mike & Donna Bennett, Certified Akita Breed Representative. The Akita…Large, dignified, courageous, and powerful. Wonderful adjectives describe the breed, but what is it really like to live with an Akita? An Akita is a loyal friend. He will often greet you at the door with the "akita dance", a woo woo or two, and a smiling face but only those closest to him get to see the puppy inside. To the rest of the world he is a noble protector ready to stand his ground if the need arises. This is generally not the breed for a first time dog owner. 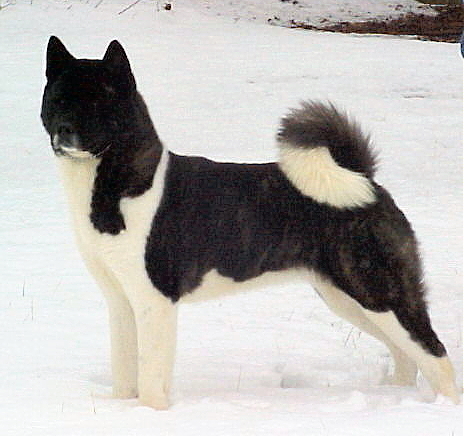 The Akita is an intelligent, independent thinker and he will quickly gain the upper hand if allowed to do so. Obedience training is a must and a great pathway to understanding the Akita mind. Photo: CH. LIBERTY’S DELICATE QUESTION Owners: Donna & Mike Bennett. She’s by Ch. Mito’s Mugshot x Ch. Asa Taiyo’s Lone Star Sunrise. Breeders: Russell & Jill Drennan and Steve & Lana Killen. An Akita has great presence and dignity. Affectionate with family, aloof with strangers, he is a natural watchdog that seldom barks unless there’s a good reason. Akitas will live happily as an only dog or with other family dogs but they may be aggressive towards non-family dogs. Knowledgeable Akita owners understand his inherent drive to be top dog and provide early socialization and obedience training. Akitas combine courage, alertness, and extraordinary strength with endurance and dominance and a properly trained Akita is a joy to live with and a good canine citizen. An undisciplined Akita can become a bully so this is not a breed for everyone. Photo: CH. 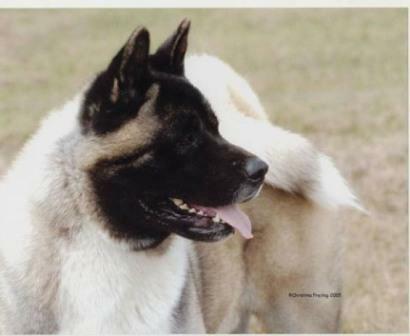 GRANDSLAM's KY BREW AT MIDNITE, AOM, TT “Bourbon” finished with 4 majors at 9 months, completed his TT (temperament test) at 22 months and quickly soared to #3 Akita. He's maturing like fine Kentucky bourbon. How would YOU characterize your breed? What do judges and families need to know in order to make the right choice? Be one of three to represent your breed. If you have bred 3 AKC/UKC Champions and/or Parent Club Top Producers, we invite you to share your knowledge with over 1.2 million individual visitors (Google Analytics) each year. Choose 1, 3, or 6 months term. If you have any questions or want to secure your position by phone, call the billing department (800) 215-1178 weekdays 9:30 - 4:30 EST. Upon payment (online or by phone) you will receive a simple email to help assemble your information If you need help call our offices or email the breed editor and we will personally assist you in maximizing your presentation.